SAN FRANCISCO/SEOUL (Reuters) - Samsung Electronics Co Ltd has wowed the smartphone industry with the first foldable screen, burnishing its innovation credentials, banishing "fast follower" criticism and, at nearly $2,000, setting a new standard in premium pricing. 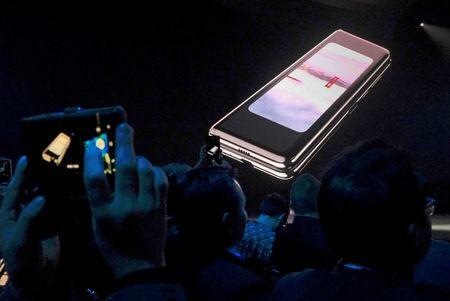 The South Korean tech giant's Galaxy Fold resembles a conventional smartphone but opens like a book to reveal a second display the size of a small tablet at 7.3 inches (18.5 cm). It will go on sale from April 26. The subsequent unveiling of the foldable device came as a shock to many in the auditorium. "I am blown away," said Patrick Moorhead of Moor Insights & Strategy, adding the phone could help Samsung rejuvenate its mobile business, whose lead is under attack from China's Huawei Technologies Co Ltd.
"I believe you can innovate your way out of a mature market," he said, noting that when Apple Inc launched the iPhone in 2007, most industry watchers believed the market had matured for $100 "candy bar" phones without touch screens. Bob O'Donnell of TECHanalysis Research said the work Samsung had done with Facebook Inc, Alphabet Inc's Google and Microsoft Corp to adapt applications to the new screen was important. 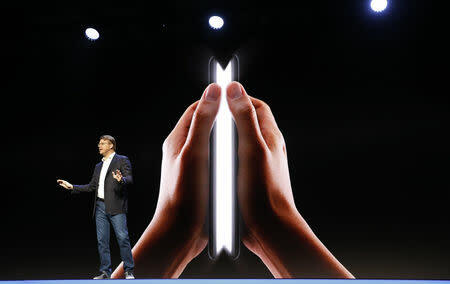 He said though Samsung had teased the folding phone before, "to see it in action, to see the software – I was like, Wow. It's hugely important that the software experience be good." The phone, which can operate three apps simultaneously and boasts six cameras, also challenges the notion of what a phone can cost, debuting at nearly twice the price of current top-of-the-line models from Apple and Samsung itself. "Due to price, it's likely to be sold mainly to early adopters. Prices are key to expanding sales," said former Samsung mobile executive Kim Yong-serk, who is now a professor at Sungkyunkwan University in Korea. "It will help Samsung burnish an image as an innovative company, but it is unlikely to be profitable. I expect Apple to wait say for one year and come up with foldable phones with more features, as they did with the smartwatch," he said. 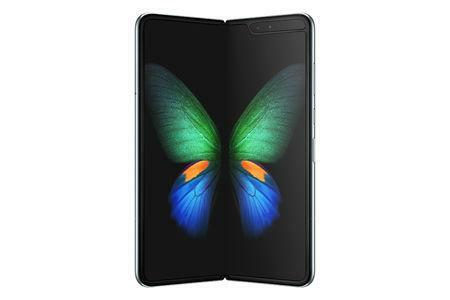 Brokerage Hana Investment & Securities expects Samsung to sell 2 million foldable phones this year, with the price keeping the volume relatively low, while another brokerage expects shipments to reach 1 million. That would be less than one percent of the 291 million smartphones Samsung sold last year. "The success of a foldable phone depends on whether it can take up demand from tablet users. We believe it will be difficult to achieve meaningful sales with a 7.3-inch screen," Meritz Securities analysts said in a note to clients. "For it to succeed, it has to evolve further so that it can support 10-inch or bigger screen with multiple foldings." Some industry watchers said such foldable phones could eat into the tablet market, which shrunk 6 percent last year even as Apple shipped more iPads. Apple's 7.9-inch screen iPad Mini4, its smallest - and cheapest - tablet, is priced $329 to $559. The U.S. firm commands 25.8 percent of the global tablet market, nearly double Samsung's 13.3 percent. Online, social media users were divided over the price, the features, and whether consumers would even need such a phone. "Innovative? Sure. Needed? Not sure. 6 cameras, 2 screens and 2 batteries at $1980?! ?," wrote Twitter user @JackPhan. Reddit user AmazedCoder took a more positive view. "The fact that people are only complaining about the price should tell you that a lot of people actually want this, but can't get it. Second gen of this thing is gonna sell like hotcakes." While most analysts expect Apple to wait until 2020 to match the foldable phone, Samsung has set new price standards in the premium category as it seeks to revive consumer interest in an industry which posted its first-ever sales decline last year. "$1980 dollar for a #galaxyfold no thanks... watch...now the next iPhone will be $1999," Twitter user @zollotech said.